Sims Recycling Solutions will host a free electronics recycling event to encourage the community to recycle their electronics during the annual Illinois Sustainable Living and Wellness Expo at Illinois Wesleyan University. Collection events like this one give area residents access to convenient, safe and responsible electronics recycling that protects their personal data and the environment. Sims Recycling Solutions, the global leader in electronics reuse and recycling, will host a free electronics recycling event to encourage the community to recycle their electronics during the annual Illinois Sustainable Living and Wellness Expo at Illinois Wesleyan University. 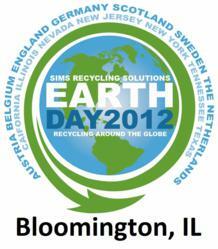 All items brought for recycling will be safely and responsibly recycled by Sims Recycling Solutions. The event will be held on April 14, 2012, at the Illinois Wesleyan University Shirk Center parking lot located at 302 E. Emerson Street, Bloomington, IL 61701 from 9:00 a.m. to 4:00 p.m. This e-waste collection event will be set up as a drive-through and drop-off event. Staff will be on hand to conveniently and quickly collect items from community members’ vehicles. Please visit http://us.simsrecycling.com/news-and-resources/events for more information. Sims Recycling Solutions can accept computers (desktops and laptops), computer monitors, printers, televisions, mobile telephones, computer cables, mice, keyboards, fax machines, MP3 players, PDAs, video game consoles, video cassette recorders and players, DVD and CD players, or similar video devices, zip drives and scanners. Sims cannot accept microwaves, air conditioners, household appliances (e.g., washers, dryers, refrigerators or water heaters), batteries, and smoke or carbon monoxide detectors. Sims Recycling Solutions (us.simsrecycling.com) is the global leader in electronics reuse and recycling, offering customers in every business sector comprehensive recycling services out of our 50 owned and operated sites across the globe. Sims Recycling Solutions – owned by Sims Metal Management, the world’s largest publicly listed metal and electronics recycler – has the global reach, expertise and infrastructure necessary to guarantee our customers that their data is secure, their electronic equipment is processed in an environmentally responsible manner, their reputation is protected and their compliance risks are eliminated. In North America, Sims Recycling Solutions operates 14 sites in Arizona, California, Florida, Illinois, Nevada, New Jersey, Ontario, South Carolina, Tennessee and Texas.